Life can be pretty hectic nowadays and all the impressions of real life plus life on-screen keep buzzing around in your brain when you could really do with a good night sleep … It doesn’t help to hardly ever have the surrounding calming dark, there is always some light on somewhere to prevent you to fall asleep. A well-fitting sleeping mask might do the trick and I will show you how to make this yourself! It’s really not that hard to do and once the materials are in place it will take you an hour of your time, maybe a few hours if you don’t have much experience behind a sewing machine. To get you on your way I’ve made you a Merckwaerdigh fully illustrated pattern included FREE download to get the job done! The FREE download includes a real size pattern of a sleeping mask where the cut-out for the nose is a bit deeper than usual. This will keep the mask flat to the face without any annoying gaps where light still creeps through! You don’t need a lot of materials so all the gorgeous remnants you kept might come in very handy now … For the mask itself you will need 3 layers of fabric each 30×9,5cm + 60cm folding elastic or bias tape for trimming the mask and to tie the mask around the head you need 35cm reasonably firm elastic of 1,5/2cm wide or 40cm firm ribbon + 4cm Velcro. The bottom layer of the mask touches the eyes and should be made of a soft dark fabric like fleece or flannel. 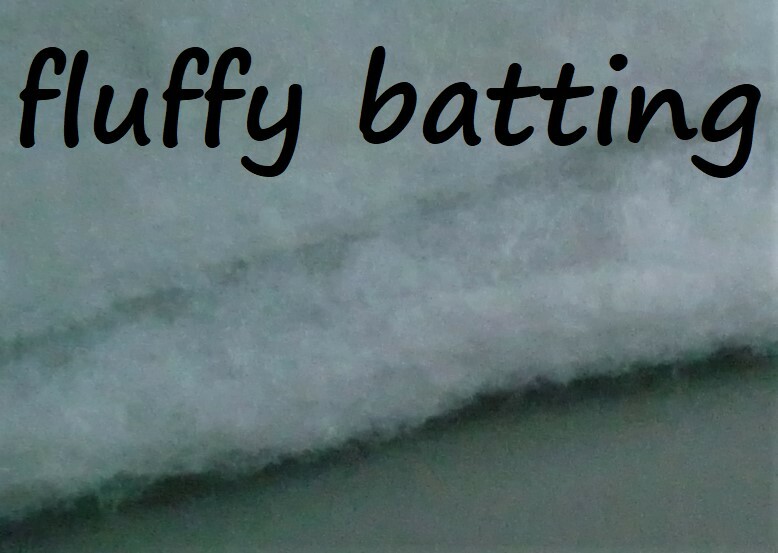 The interlining must be flexible and with fluffy volume like the batting used for stuffing pillows. You can buy this in different thickness, around 0,5/1cm thick will be fine. The top layer can be of the same material as the bottom layer but it would look great to use a more decorative fabric. You could use your remnants lace but use some lining or other fabric under it because of the openings in the lace will show the naked batting. You could also use a nice print or make your own embroidery. 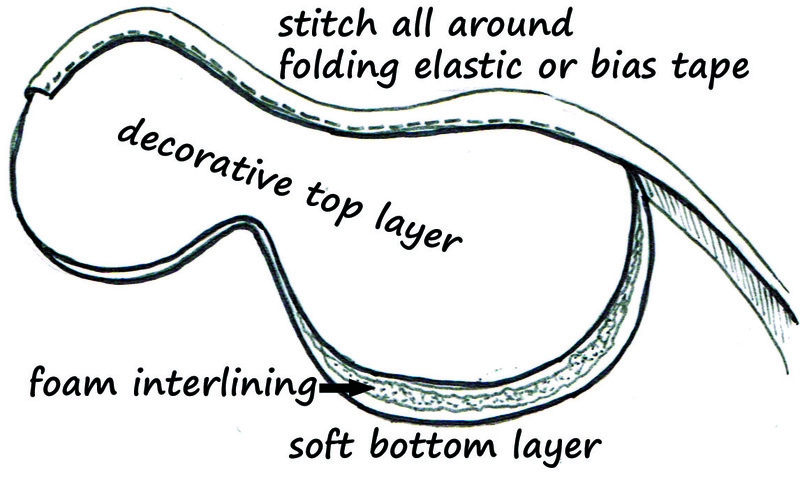 The trimming around the mask is best made out of bias tape or folding elastic (don’t stretch it!). They will fold easily around the raw edges of the thick heap of layers. It can be the same color of the top layer or you can be bold and choose a contrasting color which will form a lovely frame around the mask. It’s really not worth the effort trying to make a ‘blind seam’ instead of using tape or elastic because the fluffy batting will make it very difficult to turn it inside out smoothly. 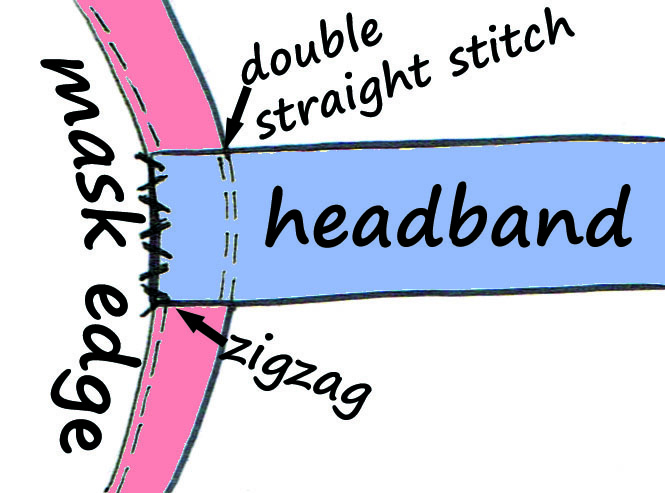 The headband has to keep the mask in place during the time one is sleeping with it but should not be too tight. You might get nightmares when your brain is not getting enough blood supply … Ribbon or any non-stretch tape can be adjusted with the Velcro each time you put the mask on but the downside : your hair might get stuck in the Velcro from time to time. Elastic band doesn’t have that disadvantage but you have to be carefull when testing the right length. Trace the pattern and cut it from each layer of fabric without any seam allowance. Then layer them up; soft bottom layer – fluffy batting layer – decorative top layer. Pin them together with the pin heads towards the mask so you can leave them on while stitching the trim around it. Don’t pin the trimming because it will start sliding away while stitching. Start at one side of the mask and just fold a small length at a time. Stitch through and through from top to bottom with a straight stitch. Check regularly whether the trim is attached to the bottom as well. Sew a 1cm overlap when returning to the starting point. All you have to do now is adding the headband. 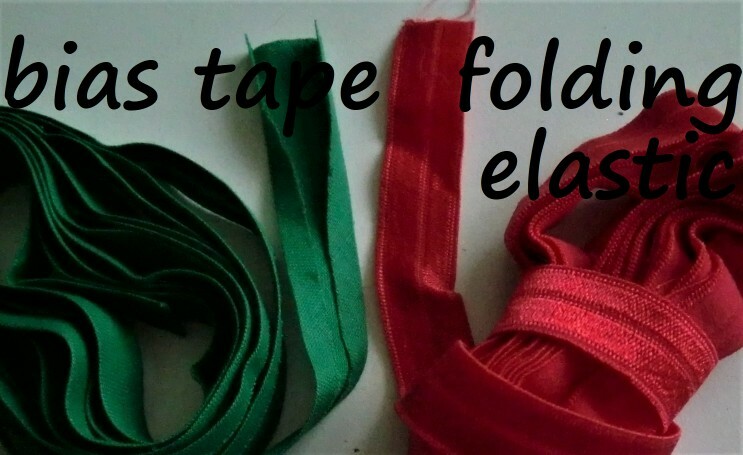 When using Velcro you cut the 40cm ribbon or band in 2 equal parts of 20cm. Stitch the Velcro at one end of both pieces with a straight stitch. Pin one piece at the other end on top of the trimming surrrounding the mask at the bottom layer, exactly where the pattern notch is placed. Sew it on with a zigzag stitch at the inner edge of the trimming and use a double row straight stitching at the the outer edge. Sew the other piece the same way at the other side of the mask. When using elastic you sew on one end the same way as above. Then try it on and pin the other end at the other side of the mask. The elastic should keep the mask in place but don’t stretch it out too much. It has to feel really comfortable. Take it off and cut the remains of the elastic, then attach the other side of the elastic. That’s all! 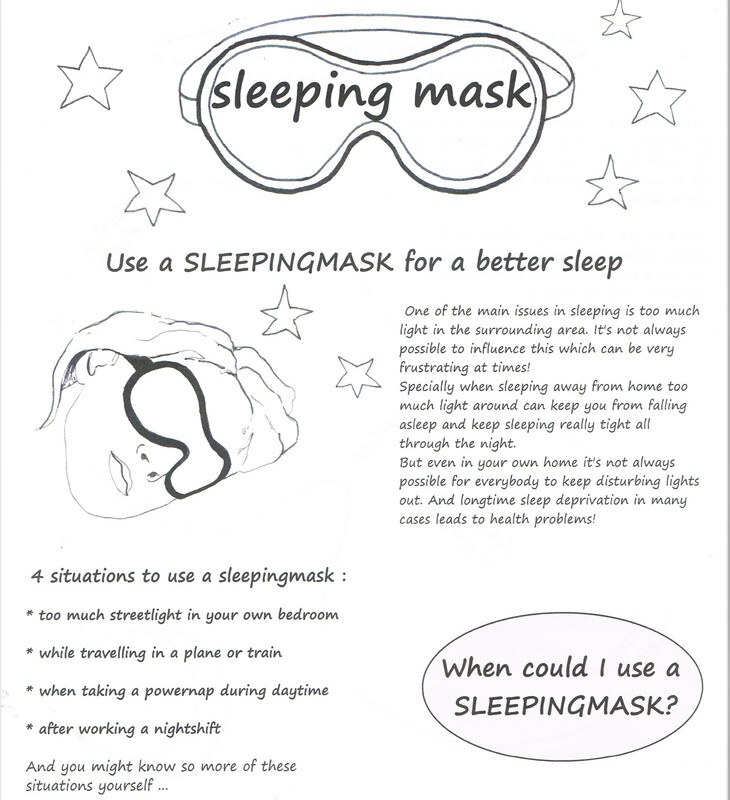 On the last page of the FREE download PDF I’ve added some design ideas for this sleeping mask, just to inspire you! You can download the pattern + illustrated process in the new FREE PDF for making a sleeping mask. This entry was posted in free downloads and tagged adjusting, bra cup, bra pattern, DIY, lace, make your own bra straps, padded straps, sew straps for swimwear, sewing, soft straps, straps, support. Bookmark the permalink. ← What is the Merckwaerdigh MINI-Course BRA?